Hello everyone. One year ago, I had this little idea floating around, but never had the chance to develop it too much until recently. Codenamed Lunar Crystal, this Windows application is a map editor. Head to the F.A.Q below to understand why was this created - for now, let us focus on what this is. You can make excellent maps with this, but do note, this is not for newbies. If you are interested in creating detailed maps with some advanced features and utilities, this application may interest you. It DOES consume more time than normal, but this isn't about time. This is about quality mapping. These are rather early stages of development, and there is so much more we can add/improve. Your comments are welcome. Read the F.A.Q. Make organized, detailed maps with all layers you want. Choose the graphic you wish, and put it anywhere on the map. You are not limited by any grid at all - just like parallax mapping. Given you can put anything anywhere, the player will also be able to move anywhere (pixel-precise), so now you can quickly tell the passable areas right in the editor! (see guidemap for more explanation). Animate your own objects with any size and frames and speed you wish. While creating your map, see your animated objects already with life right in the application! Need to make some ground quickly? Just choose your tile(s), click a button, and instantly fill the layer with it! You may create perfectly aligned rows/columns of a certain object with this powerful feature! Lunar can export to simple, text info. VX, Ace, and even other game engines can read the data and compress it in their own way. (VX will have a script to convert to secure data, for instance). 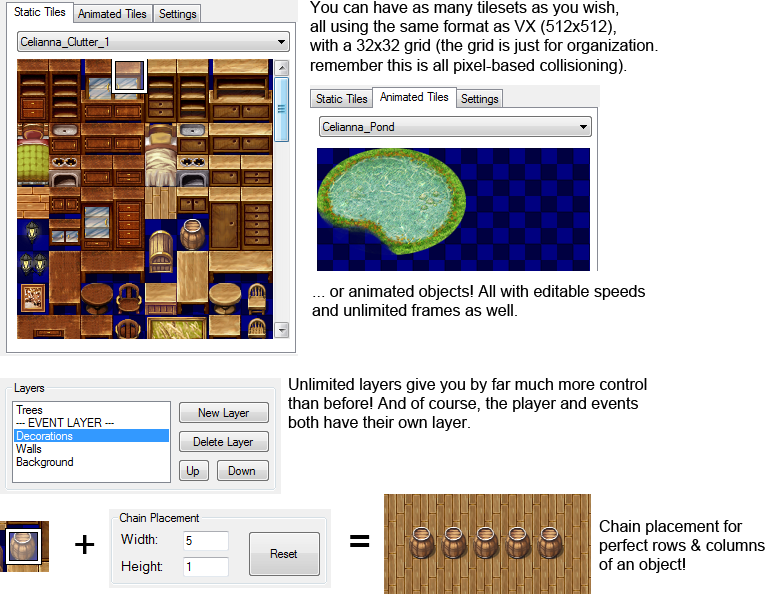 Lunar doesn't create a huge image for you to use in parallax mapping - instead, Lunar's data is used to build the map during the game - saving valuable disk space! Quickly edit lighting spots within Lunar to produce lighting in your game. Existing lighting scripts can be used along with such spots. Preview screen tint color right in Lunar. So much more, and suggestions always welcome! A simple and quick overview. It lacks some information, but it is good to get a basic idea of Lunar. Catcat helped me arrange some of Celianna's wall tilesets for usage with Lunar. Celianna gave me permission to use her tiles for Lunar testing and distribution. Xiie and Zadorain are into beta testing sometime soon. Buju made some animated water tiles (actually, he made them in exchange for that Barter script thing...). Unfortunately, I will not be using them. However, he did made an 8-directional Aluxes character too which I might actually use. Post, comment, give feedback, etc. Be active with us, let us know your ideas, and let other people know about Lunar. Are you an artist? Have you ever made tiles? Post or PM me along with the graphics giving me permission to distribute them along with Lunar - so Lunar can start off with a large graphic base immediately! We can also keep using your talents, so just let us know. Will it support VX and Ace? We're focusing on VX. If things go right, Ace support should be available soon as well. I have other projects, some similar to this, and also school. It is not possible to state an accurate release date - and I don't dare to make a guess. So will this support pixel-movement? It should give the option to both use pixel-movement mode (with a separate script) or tiled mode (VX default). 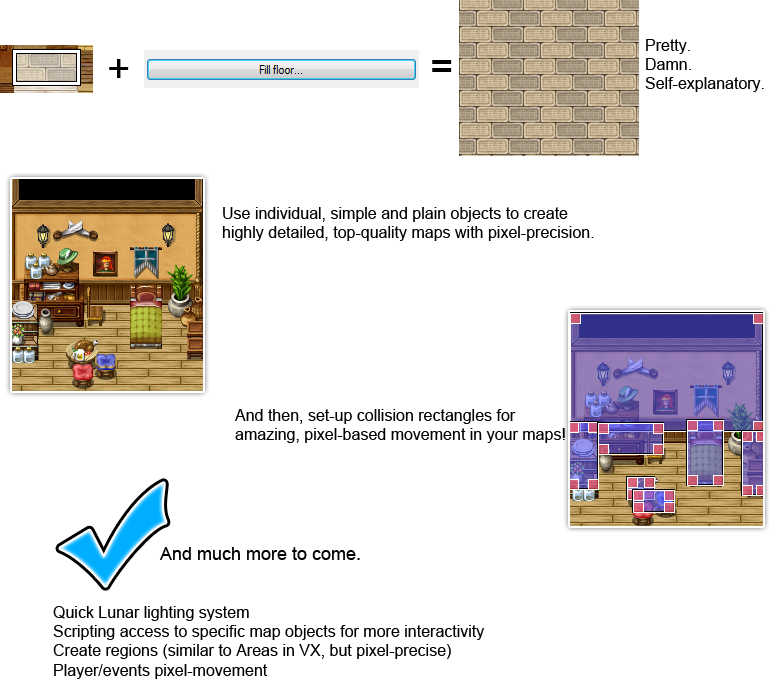 If you choose to use pixel-movement for player/events, you'll have to set collision properties with Lunar. What will Lunar actually "produce"? A large image? Data? When you are comfortable with your map, Lunar can export to a generic, plain text file. From that point, you can use a script made for VX that will convert such text data into actual rvdata, which will be used for generating the maps in your game. Lunar produces no images - saving nice disk space. How will I edit events? I haven't touched that area much. There are many proposals: perhaps Lunar can also export a big image version of the map so you can use as a reference when placing events in the game. Or maybe Lunar will setup "spots" that can be associated with your events, so it is just a matter of positioning the spots in Lunar, and editing the event's content on VX. Is this better than parallax mapping? It has some advantages. Aside from saving disk space, it can also set collision rectangles for pixel movement rather easily. If planned properly, it may be optimized enough to run smoothly. It is quite a matter of what you actually need for your game. This is debatable, but this is not the place for such. Is Lunar free for commercial usage? 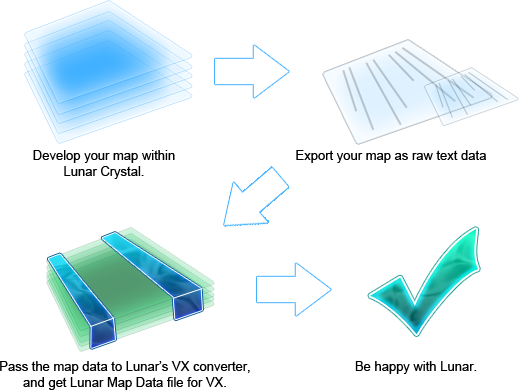 However, the graphics you used to create the maps have their own usage terms and you will have to contact their respective artists about them. It is a shame some of the images are cut off by the width of the forums - yet this is an awesome Map Editor Omegas7. This is... Amazing to say the least. I kind of geeked out a bit there. This looks to be maybe one of the best programs out there for RMing. Nah, I've been busy with college and other projects mainly and that's actually why Lunar is coming up slowly XD. oh, lol. Well, college does take priority, I will admit. However, I have to say that this is very impressive. Wow, this looks really amazing! I really do hope that you are able to finish this someday! If you did you would effectively eliminate multiple scripts and get very close to creating the "Perfect" rpg maker! Let me know if you ever need help with anything, I would be glad too. It's *Xiie, Omegas. ; n; Or change it to Reisen else no Claire for you.